Last week, I talked about Robin Williams doing the voice of the Genie in Aladdin (1992). Today, we return to the recording story to continue the story. In addition to voicing the Genie, Williams provided the voice for the peddler who introduces the movie and was planned to be revealed to be the Genie at the end. That is the reason that Williams voiced both characters who had physical similarities in their design like the eyebrows, the beard and the four fingered hands (since all other human characters had five fingers). The revelation scene was even roughly animated, but eventually cut as unnecessary and anti-climatic. For recording that introduction scene, Disney executive Jeffrey Katzenberg came up with an idea that he had seen another improvisational comedy genius, Jonathan Winters, do on the late night Jack Paar show when he was a guest. A selection of random props were brought in and covered with a sheet. Williams would reach underneath and pull out some object and just riff on it in character. He pulled out a faulty water pipe and declared in the peddler voice, "a combination hookah and coffee maker. It also makes julienne fries!" He pulled out a plastic container and said "I have never seen one of these intact before. This is the famous Dead Sea Tupperware." He then popped the lid and smiled, "Ah, still good!" Then he pulled out a bra and mimed "Look at this! It's a double slingshot." Then he placed it on his head. "A double yarmulke!" Much of the material was not appropriate for a Disney G-rated film. Because Williams ad-libbed so many of his lines, the script was rejected for a Best Adapted Screenplay Academy Award nomination. Supervising Animator Eric Goldberg would often do rough sketches of the Genie as the characters that were cut from the film like Mr. Rogers ("Don't ask for more wishes because that is redundant. Can you say 'redundant'?") or singer Michael Jackson smashing a representation of Jafar as a serpent ("Just beat it!") or former President Richard Nixon giving advice to Aladdin ("Only one way, boy. Tell her the truth. I am not a liar."). Because Robin Williams ad-libbed so many of his lines, the script of Aladdin was rejected for Best Adapted Screenplay. The Genie as Curly from the Three Stooges, Elmer Fudd, fat Elvis, young Marlon Brando, Glinda the Good Witch, comedian George Jessel, former President George H.W. Bush and more ended up on the cutting room floor as well as non-celebrity bits. After almost drowning, the Genie asks Aladdin: "So tell me, when your life passed in front of your eyes, did you go…'I'm not that interesting'." When Jafar transforms into a huge cobra, the Genie transforms into a sports referee in a black and white striped outfit ("Becoming a reptile, Unnecessary use of reptile. Five-hundred year penalty"), as well as male sportscasters and chanting female cheerleaders ("Push him Ja-FAR back!"). While Williams was recording the voice of the Genie, he would frequently receive calls from director Steven Spielberg, who at the time was working on the Holocaust film Schindler's List (1993). Spielberg would put Williams on speaker phone so he could tell jokes to the cast and crew to cheer them up after a depressing day of shooting. Some of the material that Williams used was material that he was using for Aladdin perhaps testing it to see the reaction. Just like with FernGully: The Last Rainforest, Williams was providing so much material that the screen time for his Genie character kept expanding. The Genie was getting almost as much time as the lead character, Aladdin. Test screenings of the rough animation cut indicated that the film would be a huge hit and that the favorite character was the Genie. When a fifth-grade class from a nearby school was brought in by bus to view the still-in-production film, one of the young viewers sent a "thank you" letter with a huge drawing of the blue Genie and nothing else. However, Katzenberg had given his verbal promise that Disney would not promote the Genie or Robin Williams. Katzenberg went back for a re-negotiation with Williams. Williams was convinced that since the Genie was now prominently featured in 25 percent of the film, the character should be featured in 25 percent of the movie trailer, print ad, poster and TV commercials. However, again, not to conflict with Williams' upcoming live action film Toys, he insisted that all this necessary advertising would not be done to give the audience the impression that Robin Williams and his Genie character was the star of the movie. It was not to be promoted as a "Robin Williams film. "Katzenberg readily agreed. The theatrical poster did show the Genie on only 25 percent of it but the image was huge and at the top of the artwork with the other characters much, much smaller lumped together at the bottom. Williams complained to Katzenberg who sheepishly replied that Robin's name was nowhere on the poster and the Genie image did take up only 25 percent of the surface space. Williams demanded that new posters be designed, but Katzenberg pleaded that millions of dollars had already been spent on the artwork and that it couldn't be revised until later in the run. To aggravate matters even more, while driving in downtown Los Angeles, Williams saw the bus stops with huge blue posters of the Genie, just the Genie from the waist up, advertising the forthcoming film. Williams complained to Katzenberg again, who explained that there must have been a mis-communication with some other department because Disney was so huge and this was a restriction that had not previously existed. Katzenberg removed all 300 posters in the Los Angeles area where Williams could see them, but thousands more remained at bus stops throughout the rest of the country and remained there for the length of the theatrical run without Williams' knowledge. To make matters worse, Toys performed badly at the box office and received terrible reviews. It made back less than half its production cost. Williams thought that if it had been the only "Robin Williams film" available that the film would have done better. In addition, Williams was receiving huge praise for his vocal work in Aladdin, not for his acting skills, which rankled him since he wanted to be recognized for his live performances on screen. Critics panned his work in Toys as lackluster and lacking energy, while at the same time exulting over his work as the Genie with critic Roger Ebert declaring that the Genie was "the best thing in the movie". "We had a deal," Williams said on the Today Show. "The one thing I said was I will do the voice. I'm doing it basically because I want to be part of this animation tradition. I want something for my children. One deal is, I just don't want to sell anything — as in Burger King, as in toys, as in stuff. All of a sudden, they release an advertisement. One part was the movie and the second part was where they used the movie to sell stuff. Not only did they use my voice, they took a character I did and overdubbed it to sell stuff. That was the only thing I said, 'I don't do that'. That was the one thing where they crossed the line. "I don't want to sell stuff. It's the one thing I don't do," he said. "For Mork & Mindy, they did Mork dolls and stuff. I didn't mind that because that character and image is theirs. When it happened at Disney, they apologized and said it was done by other people." Disney tried defending its treatment of Williams by saying, "He agreed to the deal, and then when the movie turned out to be a big hit, he didn't like the deal he had made." As might be expected, that defense placated no one. In February 1993, the Golden Globes gave Williams a certificate of special achievement for his work in Aladdin. He joked, "Is this like a coupon I can turn in to get a real award?" He did not mention Disney nor the film nor even his character. He pointed at Katzenberg in the audience and said, "Jeffrey KatzenBUG". It was unclear whether it was some type of joke that fell flat or a jab. Katzenberg ordered new posters for the film prominently featuring the award from the Foreign Film Critics Association. As might be expected, Williams did not like these new advertisements either. He phoned Katzenberg, yelled at him that he had repeatedly broken his word and that Williams would never make another film for Walt Disney Studios. With Oscar nominations coming up, Katzenberg was horrified by the possibility of bad publicity as he hoped to garner attention for the film and maybe even another special award for Williams. To try to make amends, Katzenberg sent Williams a painting by artist Pablo Picasso as a gift that he claimed was worth more than $5 million and with the hope that Williams might consider future projects. The painting was a self-portrait of the artist depicting himself as artist Vincent Van Gogh. It turned out that the painting had been picked up at an estate sale for less than $750,000, still a significant sum but not close to what Katzenberg had claimed. Williams and his wife felt the painting was garish and clashed with the rest of the décor of their home. Williams' friend and fellow comedian Eric Idle suggested that Williams go on live television and explain how he had been badly betrayed and burn the painting. Williams joked that he should make a copy of it and burn the copy. Williams held true to his vow and refused to look at any scripts Disney sent him. He returned all invitations to premieres and theme park events. His name and picture were not included in John Culhane's book Disney's Aladdin: The Making of an Animated Film. While the book praises Williams' work, he is constantly just referred to as "the voice of the Genie". Walt Disney Television Animation's block of programming, the Disney Afternoon, had become hugely successful. In addition, a syndicated animated television series based on the feature film The Little Mermaid also proved successful. Before Aladdin was released, Disney told Tad Stones and Alan Zalove to produce an animated series based on that new feature. Just like Duck Tales, the intention was to do an hour-long television special to introduce the new series. Stones suggested creating a straight-to-video feature to transition from the theatrical film to the series titled The Return of Jafar (1994). It would explain how Iago the parrot escaped the lamp to be a key character in the series among other things. He initially met with resistance from Feature Animation president Peter Schneider and also CEO Michael Eisner who felt that doing so would cheapen the original. However, layout designer Paul Felix came up with a striking image of a gang of thieves entering a cave and had it animated at Disney Animation Australia. Katzenberg saw it and then green-lit the project with Australia animating the first half and the climax animated in Disney's Japan studio. Of course, Williams would not reprise his role as the Genie so he was replaced by Dan Castellaneta, perhaps best known as the voice of Homer Simpson. Castellaneta was directed to try to capture the verve and spirit of the Genie, but not do an imitation of Williams' voice. He went on to supply the Genie's voice for the 65 episodes of the television series and for videogames. Jim Meskimen took over in 2008 and continues to do the voice today. In an inside joke, in The Simpsons episode Mypods and Boomsticks (November 20, 2008), the Genie appears to Homer in a nightmare where he transforms Western culture into a stereotypical Islamic empire with a Christian church changing into a mosque and all music is by Cat Stevens. Both characters were voiced by Castellaneta. Reviewers were harsh on the new straight-to-video version and often referenced the absence of Williams impacting the overall experience. However, the film had been made for $3.5 million and made more than a $100 million domestically, so it spawned the idea of inexpensive animated sequels of Disney's feature films. Katzenberg was always contentious and resigned from the Walt Disney Studios in October 1994 to form Dreamworks. He was replaced by Joe Roth, who had been in charge of film production at 20th Century Fox. Williams had a fondness for Roth because he had green-lit the production of Mrs. Doubtfire and allowed Williams' wife, Marcia Garces Williams, to be the producer. The film was a hit and Williams' second wife, who had previously been his son's nanny, was finally given some credibility in the industry. In addition, they both received advance royalties for the film from Roth. The first check was for $2 million. Roth saw that director Francis Ford Coppola was preparing a film called Jack (1996) and that the lead role was perfect for Williams. He sent him the script. Williams immediately returned the script with a note that while he would love to work with Coppola, he had vowed never to work again for Disney. He followed up with a personal phone call where Williams explained the situation and how he was treated badly by Katzenberg. Roth pointed out that Katzenberg was no longer with the company. In addition, he offered to have the company publicly apologize to Williams for their mistreatment of him. Roth then held a press conference in 1996, where the then-studio chief explained to the media how the Walt Disney Company had wronged Robin Williams. Roth then went on to offer a public apology for all wrongs previous company executives had committed against the comedian. "Robin complained that we took advantage of his performance as the Genie in the film, exploiting him to promote some other businesses inside the company. We had a specific understanding with Robin that we wouldn't do that. Nevertheless we did that. We apologize for it," Roth said. Roth then took out full-page ads in many of the industry's trade papers, explaining that the Walt Disney Company was sorry that it hadn't honored its agreement with Robin Williams. The final production that used Robin Williams as the voice of the Genie was for Disney's MathQuest with Aladdin. Williams was taken aback. He said, "It's like a country re-establishing diplomatic relations. It's a good feeling because I've done good things there. I wasn't trying to shake anybody down." He called Roth's public apology "a decent thing". Williams accepted the role in Jack and began discussions for other projects, including doing more work as the Genie. Aladdin and the King of Thieves (1996) was the second straight-to-video sequel of Disney's popular animated feature Aladdin (1992). Because of Williams, it became the No. 1 top selling video at the time of its release. Unlike The Return of Jafar (1994), which was meant to be a bridge between the original film and the syndicated television series, this sequel was designed for video from the start and to stand on it own. In The Hollywood Reporter of July 15, 1996, Tad Stones, the director and producer of the sequel said, "We were much more interested in elevating the quality of this one. The budget was bigger and animators were given more time on the projects. About a third of the movie with Dan Castellanetta as the voice of the Genie, as in the first sequel, was thrown out and we added a whole new climax when Robin [Williams] decided to return to the part." "They just apologized and that's all I wanted," said Williams who was at the party to promote the video as well as his new theatrical film for Disney called Jack. 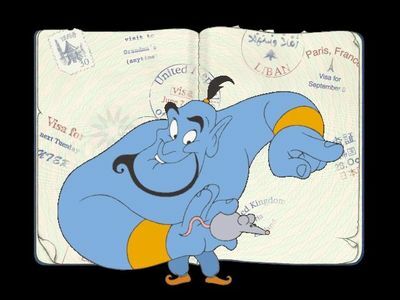 The article stated, "The beef stemmed from the studio's use of the voice recordings he made for the role of the Genie in the original theatrical feature. He said the studio used his voice in the promotion of merchandise of Disney products that he said studio executives had expressly agreed not to do so." Williams told the crowd, "They violated the one thing I said I didn't want to do. I want to make movies, not sell stuff, even though I know that's part of their business." He did point out that in the video the Genie character encourages Aladdin to "consider the marketing possibilities". In the film, the Genie transforms into Mrs. Doubtfire briefly to try to cheer Jasmine up. Williams continued to make Disney films, including Flubber (1997) and Good Will Hunting (1997) for its subsidary Miramax Pictures. For the latter film he earned a Best Supporting Actor Oscar. However, troubles soon resurfaced. Williams made Bicentennial Man (1999) for the company. He felt that Disney did not promote the film and had insisted on shaving off $20 million from its budget. He felt that reduction hurt the film's ability to be hit because important scenes had to be eliminated. The film's budget had already ballooned to a $100 million, so it was not unreasonable for Disney to ask for costs to be contained. To make matters worse, Roth left Disney. Williams never made another feature film for Disney. Williams also did voice the Genie in a series of 15 three-minute "bumpers" on ABC's One Saturday Morning in 1997 that aired between the regular cartoon shows like Doug and Recess. The series was titled Great Minds Think 4 Themselves. The Genie shared stories of great historical figures like Albert Einstein, George Washington Carver, Barbara Rose Johns, Jackie Robinson, John Muir and Susan B. Anthony and others who thought differently. These people were often considered odd or harshly criticized, but their work transformed the world by thinking differently. The Genie was traditionally animated but the rest was done with "cut out" animation. The same episodes were repeated for a few years. The final production using Williams's voice as the Genie was a 1997 computer game titled Disney's MathQuest With Aladdin that taught the fundamentals of mathematics to children aged 6-9. The goal was to defeat the evil female genie Bizarrah and trap her back in her lamp. When Williams died August 11, 2014 at the age of 63, Disney had Eric Goldberg create a tribute drawing titled "Genie in the Stars" that would appear in trade publications. The black and white graphic features the head of the smiling Genie, in the form of bright stars in the night sky, smiling down at the world and the lamp sitting on a sand dune. It was also captioned with a statement from Robert Iger, the chairman and CEO of Walt Disney. "We're deeply saddened by the loss of Robin Williams, a wonderfully gifted man who touched our hearts and never failed to make us laugh. An incredible actor and a comedic genius, Robin will always be remembered for bringing some of the world's favorite characters to life, from his zany alien on ABC's Mork & Mindy to the irascible genie in Disney's Aladdin. He was a true Disney Legend, a beloved member of our family, and he will be sorely missed. We join Robin's friends and fans everywhere in mourning, and offer our thoughts and condolences to his family during this difficult time." The lights of Broadway were darkened for the evening of August 14, 2014 and on stage the cast of the musical Aladdin honored Williams by having the audience join them in a sing-along of Friend Like Me. 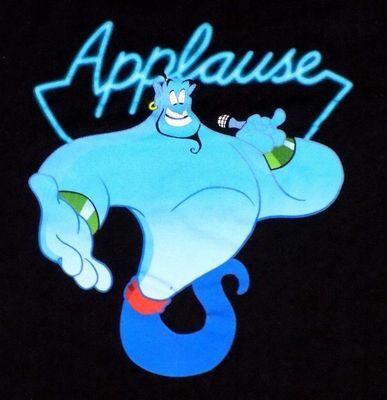 Somewhere between 16 and 30 hours of outtakes exist of Williams doing the Genie. At one point it was considered doing a Frankenstein-type of endeavor of stitching some of them together into another film with the Genie. In his will, Williams bequeathed to the Windfall Foundation, a non-profit corporation he had his attorneys set up, the rights to what he looked like, what he sounded like, his signature, his name and more with the stipulation that they could not be used for 25 years after his death or the year 2039. There could be no movies, television shows, advertisements, no digital insertions, no holograms, no new use of any existing material. So Disney is unable to make another film using the Williams' outtakes for another two decades. Another great column! Out of curiosity, was it one of the other voice actors you mentioned who voiced the Genie in the Wishes fireworks spectacular? Most interesting - thanks for posting, Jim! Out of curiosity, was it one of the other voice actors you mentioned who voiced the Genie in the Wishes fireworks spectacular? I'm pretty sure that's Dan Castellaneta, who also voices Homer Simpson among others. "To make matters worse, Toys performed badly at the box office and received terrible reviews. It made back less than half its production cost. Williams thought that if it had been the only "Robin Williams film" available that the film would have done better." We saw Toys years ago due to Robin Williams in it, and I still want my money back. Don't think even if anyone else voiced the genie in Aladdin it would have made any difference in how bad Toys did. Great information on Robin and his work as the genie.